On paper, the tongue of a Pallas’ long-tongued bat (Glossophaga soricina) may sound a bit like something from a horror movie. The South American bat’s tongue is made of spongy, erectile tissue, allowing it to increase its length by 50 percent when engorged with blood. It’s covered in an array of tiny, densely-packed hairs, which then stand perpendicular to the tongue when fully extended, allowing it to better capture the fluids the bat devours to stay alive. In practice though, none of this seems very grotesque, because G. soricina only uses its tongue to lap up nectar out of flowers, placing this bat in a niche closer to a honeybee than a vampiric parasite. Scientists studying pollinators have found that the importance of vertebrate pollinators like G. soricina may be widely underappreciated. 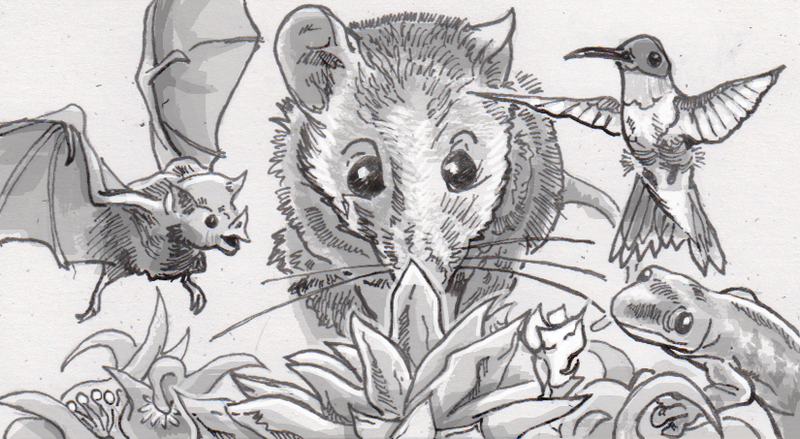 For all the attention played to pollinating bees and butterflies, a large number of plant species largely depend on bigger critters like bats, mice and even lemurs to fertilize their flowers. These aren’t strictly fringe cases either, as some flowers have evolved to be highly specialized, and thus dependent on just the right species of mammal or bird to be able to reproduce. Among mammals, bats are the most common pollinators, sometimes accounting for 83 percent of fruit production in a geographic region. They’re known to pollinate close to 530 species of plants around the world, often in relatively exclusive arrangements. For example, the blue agave cactus (Agave tequilana) which is used to make tequila, only open their flowers at night in order to attract greater (Leptonycteris nivalis) and lesser (Leptonycteris yerbabuenae) long-nosed bats. These bats don’t have hairy tongues, but the hair on their bodies collect and spread pollen just like the fuzz on a bumble bee. As the specialized beak and tongue of a hummingbird indicates, many species of our feathered friends also act as important pollinators. Beyond hummingbirds, 920 species of bird are known to spread pollen between flowers, and are estimated to account for five percent of flower fertilization where they live. In more isolated environments, like islands, that number goes up, with birds being responsible for at least ten percent of flower pollination. The success of pollinating bees, bats and birds may suggest that flight is somehow necessary to pollinate a flower, but that’s not the case. Any animal that wants to sip nectar without destroying the flower that produced it can potentially act as a pollinator, which has lead to at least 85 plant species around the world that get regular visits from non-winged mammals. Mice, squirrels, possums and lemurs may all stick their noses into flowers enough to transport pollen. Even without fur, bluetail day geckos (Phelsuma cepediana) can act as pollinators, carrying sticky pollen on the tips of their noses. As humans become more appreciative of how insect pollinators help keep ecosystems alive, this research shows that we need to also consider the bigger-bodied pollinators as well. As policies and even substitutes are being developed to help protect creatures we associate with plants humans grow on farms, we need to make sure the wider range of pollinators around the world are protected as well. After all, some of these pollinators have become very adept at their sticky, hairy line of work, and won’t be easily replaced.